47.7% of all emails sent today are spam. How do email service providers learn how to detect spam and defend against it? Like a credit score, an “email sender reputation” is used to rank email senders based on trustworthiness. The higher your email “credit score” is, the more likely it is that your emails will be delivered. The lower your “credit score” is, the more likely it is that they will never even be seen. But how can you control your email sender reputation? Before anything else occurs, email senders are authenticated. Authentication can occur through multiple types of technology: SPF, DKIM, or DMARC. Authentication ensures that emails are being sent by who they say they are and that they haven’t been altered in transit. MassMailer provides email deliverability functions to verify these settings before emails are sent, thereby improving the likelihood of deliverability and reducing the chances of email blacklisting. Quantity: How Much Email is Too Much? Everyone knows that sending “too many” emails is bad, but the truth is a little more complicated than that. The number of emails you send is actually an amplifier. The more emails you send, the more likely your emails are to be marked as spam. How many is “too many” depends on your audience and the types of email you’re sending. Receiving too many emails is the leading cause of unsubscriptions. If you’re sending three emails a day and your customers are opening these emails, remaining subscribed, and clicking on links, you aren’t going to take a reputation hit. If you’re sending an email a week and your customers are unsubscribing, marking it as spam, or deleting it without looking at it, you can take a reputation hit. MassMailer helps with this by helping you track email engagement. By tracking your engagement, you can see when your engagement starts to fall off related to the number of emails you send. Blacklists: Do You Know Your Domain or IP Reputation? Each email service and spam blocking service maintains its own blacklists. These blacklists are often shared among services to make them more effective. If you get blacklisted by domain or IP by one service, you’re more likely to be blacklisted by others. Your domain or IP can become blacklisted for any of the reasons on this list, such as sending a lot of emails at once, getting your emails marked as spam, or sending emails that have not been properly authenticated. Once your domain or IP is blacklisted, all emails originating from there will have a lower reputation score. This is also why it’s best to have a dedicated email server. A shared email server also shares an IP and domain reputation. If others on your email server have been sending out spam email, you will already have a poor IP or domain reputation. Recovering a damaged reputation is much harder than building a reputation from scratch. Spam: Are Your Emails Being Marked as Spam? If they never signed up for the email in the first place. If they are getting too many emails from a service. If they can’t find a way to easily unsubscribe from a service. MassMailer helps the above issues by making it easier for recipients to unsubscribe and by providing tracking and engagement metrics. To further protect your reputation, you should ensure that emails are sent only to those who have subscribed to them. Spam Traps: Have You Triggered Any? Spam traps are fake email addresses that are seeded on email lists. If you send an email to these fake email addresses, your email sender reputation goes down: you’re automatically presumed to be sending unsolicited emails. It makes sense, as the only way you could get these fake email addresses is by either purchasing an email list or scraping the emails from a fake site. 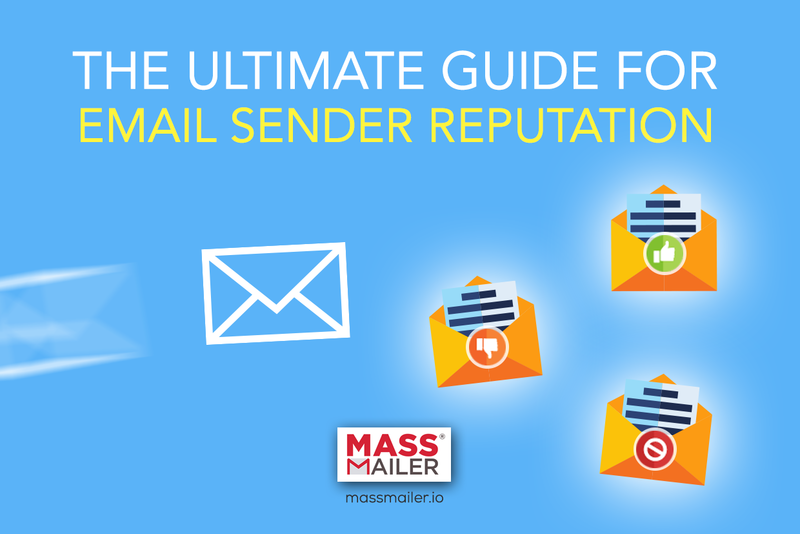 MassMailer can be used to detect and remove spam traps, validating email lists and ensuring that you’re sending emails only to real, active email addresses. Fake email addresses aren’t just a problem because they could be spam traps: they also throw off your marketing metrics, as they make it appear as though your engagement is lower than it really is. Bounced Emails: Are Your Emails Being Received? Regularly validate your email lists. Bounced emails will harm your email reputation over time, as it will show that your emails are being sent to email addresses that don’t exist or are currently defunct. Culling your email lists from time to time to remove inactive emails is advised: not only does it harm your reputation, but it makes it seem as though your emails aren’t being reacted to. Additionally, you should make sure that emails are validated when they are collected. Have users verify their email address in order to subscribe to things like mailing lists — otherwise you could end up sending emails to take addresses. Engagement: How Are Your Users Interacting With Your Emails? Are users opening your emails and clicking on links? Or are users just reading the subject line and immediately deleting it? User engagement matters for more than just your internal metrics. It also matters in terms of whether your email quality is highly ranked. Tailoring your email content to your audience is important — and it’s a process. MassMailer’s metrics let you track behavioral trends over time. Through MassMailer, you’ll be able to see whether interest in your email campaign is dropping, whether unsubscriptions have gone up, or whether general engagement has gone down. You’ll also be able to see which content is more interesting to your users and which content is leading to higher levels of engagement. Your sender reputation is incredibly important. If you have a poor email sender reputation, you could be sending out emails to no one at all. MassMailer’s email deliverability features provide comprehensive solutions to defeat many common issues. From detecting spam traps to tracking your engagement, the MassMailer platform provides everything you need to create a successful marketing campaign.